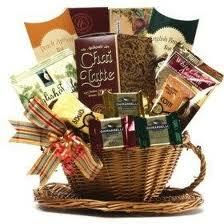 We can create a gift basket out of almost anything! We carry some very creative containers, seasonal & occasional boxes as well as beautiful ribbons and bows to make sure each one looks as special as the person you are buying it for! Give us your price range and an idea of some favourites and we will build it to perfection! We deliver locally, Midland, Penetanguishene and the surrounding areas. For Holidays we need at least 3 days notice. You can stop in or call us to place your order. Sweet Treats ~ can include Belgian Chocolate, Fresh Fudge, Chocolate Covered Marshmallows, Candy Rocks, Chocolate Covered Popcorn, Chocolate Dipped Oreos, Chocolate Covered Licorice or Pretzels, Chocolate Espresso Beans, TickleSticks, Mints etc. 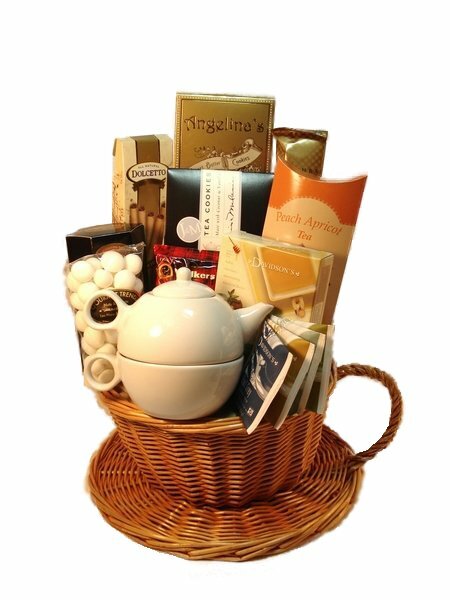 Premium Coffee or Gourmet Tea ~ Our Fair Trade/Organic Coffee or Gourmet Teas along with accessories, a mug, teapot, cookies or small decadent treats, Gourmet Biscotti, Sugar Free Tea Candies (high in antioxidents) as well as anything else you would like to add. Chocoholic ~ I'm thinking this is pretty self explanatory. We make all of our chocolate on site daily and use only the freshest ingredients. Truffles, Barks, Macaroons, Chocolate Pizza, Chocolate Covered Marshmallows, Licorice, Pretzles or Oreos, themed Chocolate Suckers, Chocolate Covered FUDGE and so many more items! If you have a special occasion, we will work with you to make it perfect, just consult with our staff. Corporate Orders are very welcome! 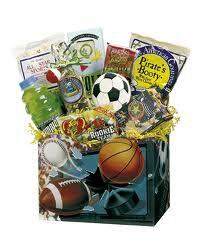 We can do baskets for your employees or your clients, just give us the details! If you own a business and want to do something nice for your staff, just give us a list of birthdays. We'll have your staff do a 'wish list' and deliver a basket on their birthday!Get your shopping done quickly and easily. 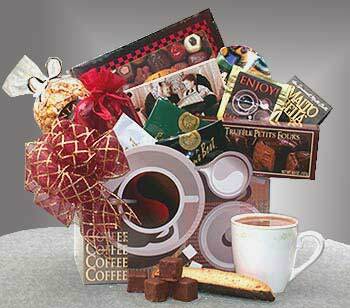 You can also add your company items, a bottle of spirits, a CD or anything else and we'll work around it. Just provide us with the recipients information, date required, amount and theme and let us take care of the rest!